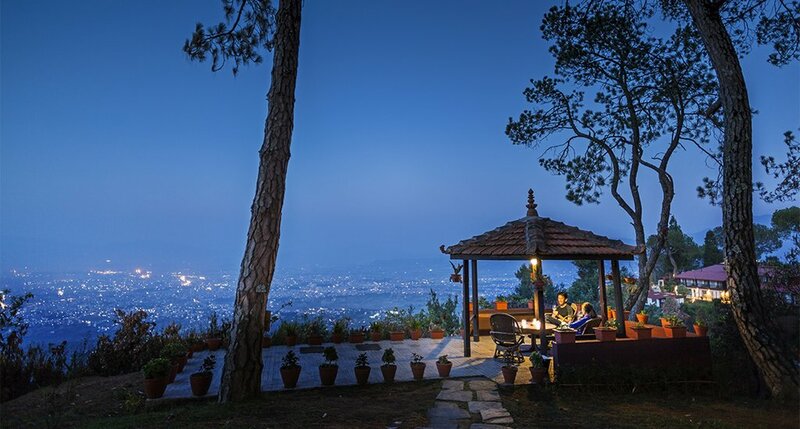 Kathmandu can be a hectic place, but fortunately you don't need to go far from the center of the city to enjoy some fresh air, peace and quiet, beautiful views, and chilled-out ambience. These places — which are either on the edge of the Kathmandu Valley or just outside of it — are the perfect antidote to Nepal's capital city. 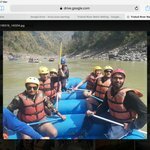 Just north of central Kathmandu are the beautiful and homely Shivapuri Heights Cottages, family-run accommodation at its best and definitely the nicest home-away-from-home you'll find in Kathmandu. Run by a British-Nepali couple with extensive local knowledge, this is the perfect place to base yourself in Kathmandu from the beginning, for insider tips. It's close enough to the center to be practical for city sightseeing, yet far enough away to be peaceful. Perched on a hillside with magnificent views of the valley below, each room and cottage is unique, with lots of individual touches. The delicious meals are homemade and served on the terrace with a view, or in the cozy family-style dining room. From Shivapuri Heights Cottages you can visit the Shivapuri-Nagarjun National Park, the famous reclining Vishnu statue at Budhanilkantha, the Namkha Monastery, or Dadagaon Tamang village. There's also a lovely spa and small plunge pool, for on-site relaxation. 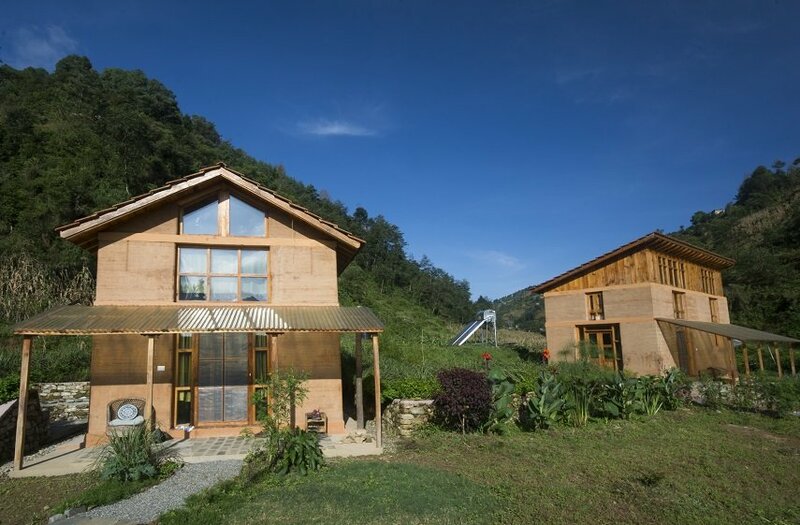 A farm stay at Herb Nepal, near Bhaktapur, is sure to be a different and memorable travel experience. The place offers training in permaculture methods, as well as accommodation. They work with Nepali farmers to bring organic, sustainable land-use and herbal processing back into poor rural communities. At this eco-friendly resort, guests stay in buildings made from rammed earth, which is durable and earthquake-resilient. Herb Nepal is especially suitable for families traveling to Nepal, as they have created a family-friendly space that allows children to play and adults to relax. There are farm animals to play with, and a stream to splash around in, as well as large grounds to play in. Just 20 minutes north-east of central Kathmandu, Gokarna Forest Resort is located within a 470-acre forest that was once the private hunting playground of the Nepali kings. The resort is surrounded by one of Nepal's only golf courses (where monkeys running away with golf balls is a daily occurrence!) as well as a large, protected forest in which you can see monkeys, deer, and possibly even leopards! Guided walks can be arranged around the forest and to nearby temples. The red-brick architecture was inspired by the old royal palaces of Nepal. Rooms have large windows that look out over the forest and golf course and are large and tastefully decorated. There's an on-site spa, pool, and sauna. 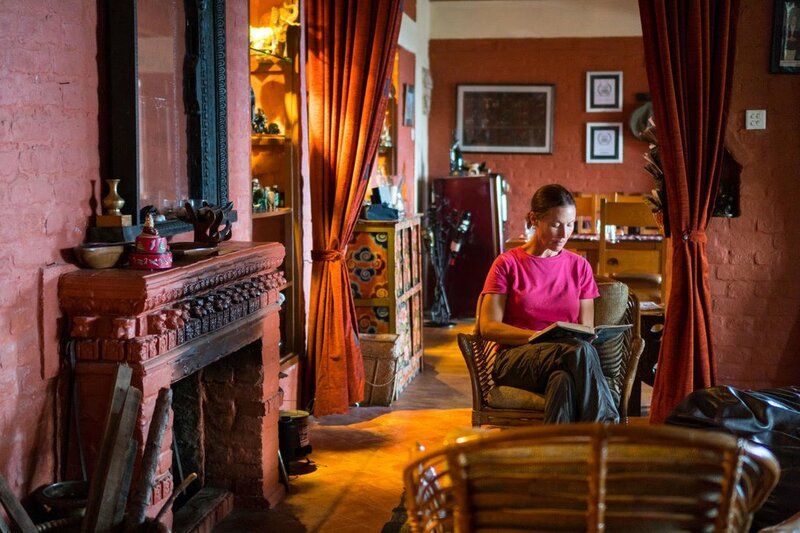 The original Dwarika's Hotel in Kathmandu is one of the finest hotels in the whole of Nepal. Dwarika's Resort Dhulikhel takes the luxury and elegance of the old hotel and puts it in the hills just outside the valley. Dhulikhel is about 90 minutes' drive from central Kathmandu, but the atmosphere here is entirely rural. Dwarika's Resort offers some of the best high-end accommodation in Nepal. 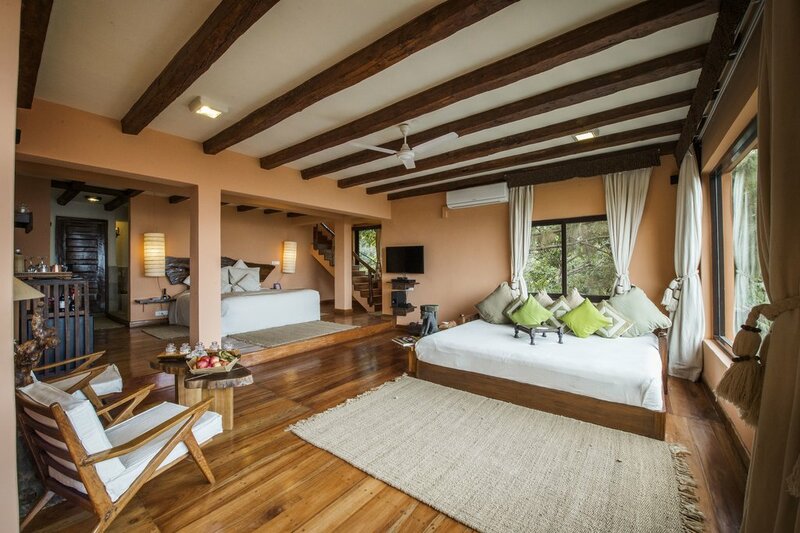 The buildings were constructed with mostly local materials, and the rooms are decorated with natural, earthy decor. Stunning mountain views can be seen from the outdoor terrace areas, and the sunsets are particularly memorable in this area, with the Himalayas lit up. The on-site spa is inspired by Vedic philosophy and Buddhist medicine and offers a range of treatments. Perched high up on a ridge, the Himalayan views from the Namo Buddha Resort are exceptional. 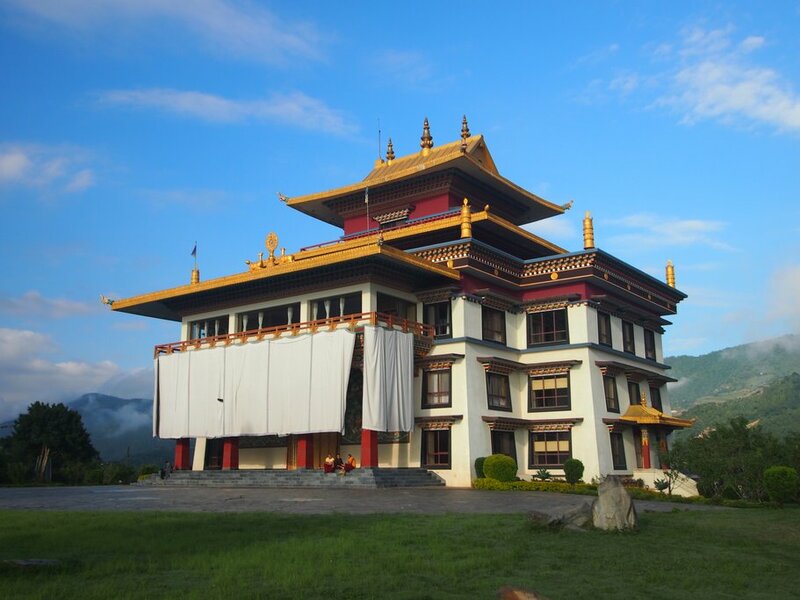 The town of Namo Buddha is a couple of hours drive from central Kathmandu, and is an important Tibetan Buddhist pilgrimage site, so a stay at the Namo Buddha Resort combines rustic comfort and cultural attractions. The resort's cute Nepali-style cottages are spread out among well-tended gardens. The food here is also famous, with people making day trips from Kathmandu just to stop by for lunch. It's all vegetarian and made from produce from the organic garden. 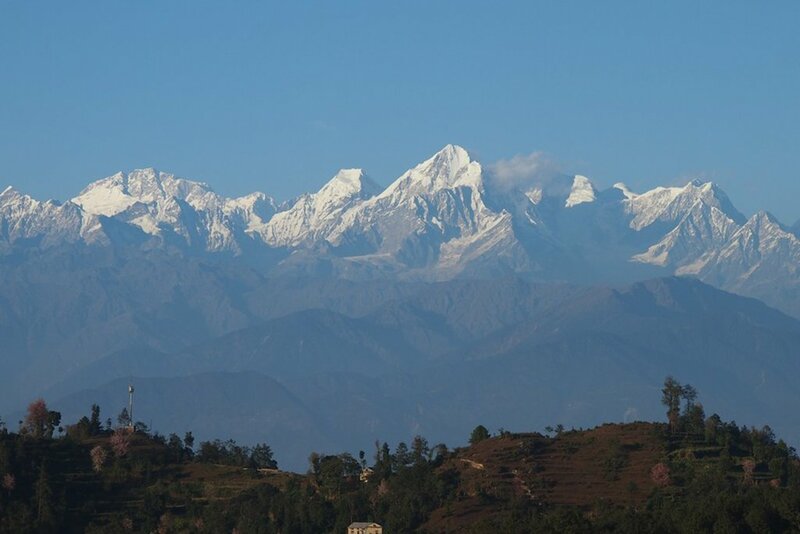 From the resort, you can take short hikes to neighboring Tamang villages, to the Buddhist monastery and stupa in the small town of Namo Buddha, or longer hikes to neighboring towns like Dhulikhel or Panauti. The Neydo Hotel is attached to the Neydo Tashi Choling Monastery in Pharping, in the hills south of Kathmandu. It's a particularly good place for a retreat, such as a yoga or meditation retreat, as there are large meeting areas and knowledgeable monks who can discuss aspects of Buddhist practice and philosophy. The large Buddha inside the monastery is very beautiful. Pharping is an attractive area in itself, surrounded by terraced farmland. There's an important Buddhist meditation cave located just behind the town. Pharping is also near the famous Dakshinkali Temple, where animals are ritually sacrificed to the goddess Kali. Also in the south of the valley, near Pharping, is the Himalayan Height Resort, Hattiban. This lovely place is part of the Everest Summit Lodges group, that have beautiful lodges throughout the Everest region for a comfortable accommodation option while trekking. 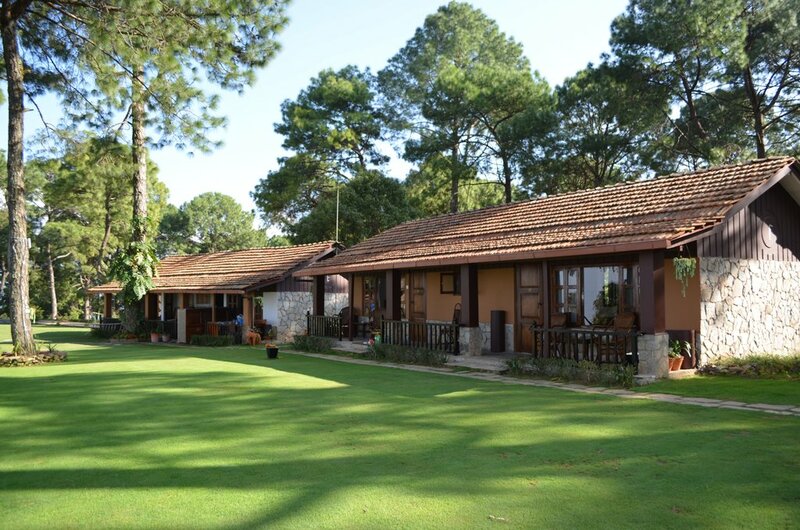 The Himalayan Height Resort is peaceful, as it's the only resort in the vicinity, and is surrounded by pine forest. There are sweeping views of Kathmandu down below, and the Himalayan peaks beyond on a clear day. Accommodation is in individual cottages located within spacious gardens, and there's a spa and sauna facilities. As well as walking to Pharping/Dakshinkali from the resort (about three hours), it's a good place to base yourself for a hike up Champa Devi, one of the highest hills of the Kathmandu Valley at 2285 meters (7496 feet). With Hindu and Buddhist shrines at the peak, it's an important pilgrimage site on full moon days.